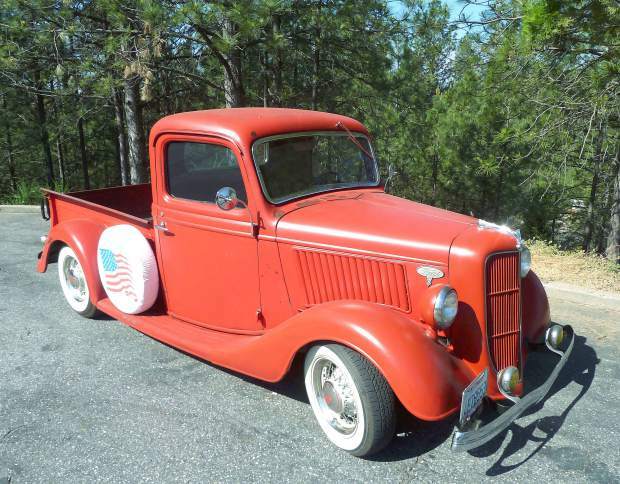 The Ford Model 51 pickup was built in 1935 and 1936, changing little for the second year. The 51âs Vâd grill, sloping windshield and rounded cab gave it a more modern look, less like the dated Model A look of the â34 pickup. Although Al Mangini was no novice at vehicle restoration when he started on his ’36 Ford pickup in 2014, his previous endeavors had been on two wheels. In 2013, he was in the home shop of his friend, local hot rodder George Beaty, when he noticed the cab of a ’36 Ford pickup sitting off to the side and asked about it. Although the body was pretty much complete, except for the cab it was a basket case, all apart. The cab had the windshield and gauges still in it, but the other windows and door regulators were in boxes with other parts. While Al described it as a “fairly decent body,” there was some rust and other minor damage in need of repair. The paint was “60 percent original,” a little faded and worn through with age at places, but still there. Robin put her dibs on the truck. Twenty years ago, they had a ’54 five-window Chevy pickup as a daily driver. “My wife always liked to drive it,” Al said. But he sold it to buy a Mustang convertible. The ’36 Ford became hers and he could not sell it unless she was willing. Using Craigslist for Bodega Bay, Al found a rolling chassis from a ’35 Ford pickup that had burned. It had a Ford 8” rearend and the original straight axle in front with disc brakes. Through Craigslist in Grass Valley, he found an old motor home that was drivable. He bought it and pulled its Ford 351 cubic inch Windsor engine and C-6 auto trans for running gear. After pulling out wiring to make a loom for the Ford, he sold parts off the motor home before sending it to an auto recycler. On Yuba City’s Craigslist, he found a set of Vintique wire wheels and decent tires that would fit. It cost him far less than if he had used new parts. “You can still build them cheap if you hunt down all the parts and have patience,” he said. “it’s like what I did in high school. It made me feel young again.” Of course, scrounging parts was a little more difficult before Craigslist. The few things that Al bought new were the radiator from Speedway and a set of modern gauges since the original ones were 6-volt and the alternator from the motor home was 12-volt. Converting the old ones to 12 volt wouldn’t have been cheap. He also had a custom driveshaft made for the Ford by Drive Line Service. For the exterior, Al had a paint store match the original red on the truck and he painted the grill and fenders. He also repainted the dash. Instead of installing a new headliner, he painted the ceiling black with red accents. Robin redid the seat with black Naugahyde. For floor mats, he threw in a couple of rubber Harley ones he had left around. He opted out on a sound system. The whole project took only six months, from January to June of 2014. Once it was finished, friend George Beaty seemed to regret ever selling it. But what about his love of Harleys? He sold his last two bikes, his ’66 and ’72 police Harleys, when he took on building the Ford and has no plans to go back to them. For Al, running on two wheels is history.